It is December in Montana. We received our first snowfall that stayed with us. Temperatures have dipped. We received a call: “Help. 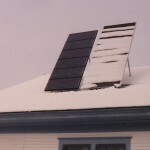 It is a beautiful day outside and my inverter is in nighttime mode.” We asked if there was snow on the modules. Sure enough, they were covered and the modules were shut down. Not to worry. 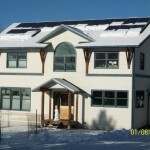 In Western Montana, grid-tie, net-metered homes make a majority of their solar power in the summer months. 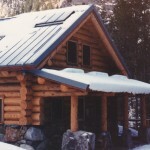 Winter power generation is a bonus, rather than a necessity. The days are shorter, the sun is lower and the sky is often overcast. This does not mean that we don’t generate any power, it just means that we generate significantly less in the months around solstice. Our sizing programs illustrate this well. December sunlight is summarized as 1.7 equivalent average sun hours while July data shows 7.5 average hours. So relax. Modules are generally set at an angle that enough snow will begin to shed, temperatures permitting. The cells are of dark colors that increases melting and with enough consecutive sunny days your modules will be generating power once again.